Help the People’s Bank of Govanhill! The People’s Bank of Govanhill is a local currency project which grew out of my time as artist in residence at Govanhill Baths. The aim of the project is to create a new form of currency in Govanhill, through a series of currency experiments, workshops and discussion events talking about money; looking at what’s wrong with our current economic situation and what we can do to change it. 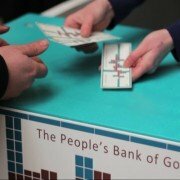 The People’s Bank of Govanhill is an action research project, testing out different forms of local currency in order to find out what works best for the community and engaging local people in discussion. The exchange booth allows you to exchange Govanhill notes for sterling on a pay-what-you-can-afford basis. Each time the booth operates the notes can be used as vouchers exchangeable for local goods and services. 1 Govanhill note : 100th of your weekly income. The first set of Govanhill notes was designed during my residency at the Baths in 2015. There are now around 200 of these notes in circulation. A second set of notes is being designed by Govanhill based artist Marvyn Gaye Chetwynd but we need your support to print them. We really need your help to keep this project going, to print some new notes for The People’s Bank of Govanhill and to allow us to carry on this programme of events and ultimately to develop a local currency in Govanhill. The project has no core funding so is entirely reliant on donations and small grants to keep going. If we reach our target we will also then have enough money to commission one more local artist to design the third set of notes. The new notes will be launched at Govanhill Baths in April, with a series of currency exchange events to follow. Everyone who donates will receive a printed Govanhill note. We ask that you consider our pay-what-you-can-afford exchange rate and donate what you can afford to help us realise this next stage of the project. The notes are hand screen printed and then signed, dated and editioned. You can choose whether to keep these notes as souvenirs or to use them and participate in local exchange projects. With your help, we can strengthen our local economy and community together. https://www.govanhillbaths.com/wp-content/uploads/2016/03/point-of-exchange.jpg 500 752 editor https://www.govanhillbaths.com/wp-content/uploads/2014/12/Govenhill-Baths-alt-Logo.png editor2016-03-01 12:52:402016-03-01 12:53:14Help the People's Bank of Govanhill!